With my five previous posts I have shaped a series of blogs reporting on the European Conference on Educational Research (ECER 2017) that took place last week in Copenhagen. The first post outlined an agenda of themes to be covered. The second post provided insights into my own presentation. The third post discussed the themes ‘qualification frameworks’ and ‘credit transfer’. The fourth post discussed reforms in vocational teacher education and issues related to practicum studies of teacher candidates. The fifth post reported on a special research workshop that discussed ‘multi-methodological strategies in research on vocational education and training (VET). In this concluding post I will report of common events of the European Vocational Education and Training Research Network (VETNET) and on developments in the VETNET community. I will start with the common events in Copenhagen and then move to issues on the VETNET community and its activities. For many years the program of the VETNET network at ECER has been started with an Opening Colloquium or Keynote speech with discussants. In most cases this opening session has made visible VET research and current issues in VET development in the host country. This time the VETNET coordinators – Barbara E. Stalder and Christof Nägele – and their ‘local’ counterparts – Vibe Aarkrog and Christian Helms Jörgensen – had provided a two-course menu with desserts. Firstly, Vibe Aarkrog (from Copenhagen) gave insights into the host country with her presentation “A Danish perspective on VET: current challenges and recent changes”. Then Christian Helms Jörgensen (from Roskilde) broadened the discussion into the group of Nordic countries with his presentation “What can be learned from the Nordic VET-systems?”. Both presentations opened interesting insights into successive reforms and their main effects and (unexpected) consequences – and into modifications or counter-steering measures following each other. These input speeches were followed by comments of Lorenz Lassnigg (from Austria) and Stephanie Allais (from South Africa). Here I do not try to go into details. I am looking forward to the publication of the presentations on the Vetnetsite. The WERA network “Internationalisation of Research in Vocational Education and Training (IRNVET) – the global counterpart of the VETNET network had completed its working period in January 2017. As we remember, this wider international research network (under the auspices of the World Educational Research Association) had been initiated also at ECER 2013 in Istanbul and launched at ECER 2014 in Porto. This network had provided wider international support for the development of the IJRVET and international VET conferences and explored the basis for common thematic initiatives. The successor network (also called IRNVET) will continue the work in the years 2017 -2019. The International VET Conferences (in Stockholm and in Bremen 2015/Rostock 2017) organised by host universities with the support of VETNET and IRNVET have also created their own traditions. During the ECER 2017 the host universities had reached a working agreement that both conferences will work on a biennial schedule and as Spring conferences. In Spring 2018 Stockholm University will organise its cruise conference as usual but the next one in 2020. In Spring 2019 the University of Valencia will host the next “Crossing boundaries in VET” conference to be followed by the next one in 2021. In this way the two conferences will work as mutually coordinated ‘neighbours’. The VETNET contribution to European Skills Week is a new form of cooperation between the European Commission and the VETNET network. The cooperation emerged as a spin-off from the Bremen International VET conference in 2015 and took shape as a Research Workshop in the European Skills Week in Brussels in 2016. Now the VETNET network is preparing a new research workshop for the European Skills Week 2017. In this context the VETNET network has the possibility to award European VET researchers or research projects for special merits. This activity is led by Barbara E. Stalder. The cooperation of VETNET with Emerging Researcher’ Network of EERA had been successfully continued with a specific workshop led by Christof Nägele, Michael Gessler and Lazaro Moreno. Based on the impressive activity report the General Assembly was happy to carry out the election of a new VETNET Board (see more on this in a short while on the Vetnetsite. 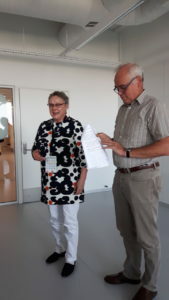 A special moment in the meeting was when the VETNET board proposed to nominate Prof. Dr. Johanna Lasonen from the University of South Florida (Tampa, Florida) and the University of Jyväskylä (Finland) as a new Honorary Member of the VETNET. This nomination will be forwarded to the Council of the European Educational Research Association (EERA). Below we see Johanna and Ludger Deitmer who presented the laudatio for Johanna on behalf of the VETNET Board. We congratulate Johanna for the nomination and look forward to the confirmation by the EERA Council. In the light of the reporting on the VETNET sessions in my previous posts and on the network activities in this post we can be happy with the ECER 2017 and the VETNET program. Many thanks in particular to the VETNET coordinators Christof Nägele and Barbara Stalder, who put a great effort in getting everything working smoothly. Also, we can look forward to the next ECER that will take place in September 2018 in Bolzano (Bozen), Italy. The stand of the local organising committee in the exhibition area provided us helpful information and delicious apples from the region. Moreover, in Copenhagen we got acquainted with new participants from Italy and Spain who were developing ‘college research’ and continuing professional development in the field of VET. We are looking forward to new productive cooperation partnerships (also in the context of preparing the ECER 2018). Let us see, what we can achieve by that time. This entry was posted on Thursday, August 31st, 2017 at 17:12	and is filed under Community, education, Knowledge development, research, workinglearning. You can follow any responses to this entry through the RSS 2.0 feed. Both comments and pings are currently closed.